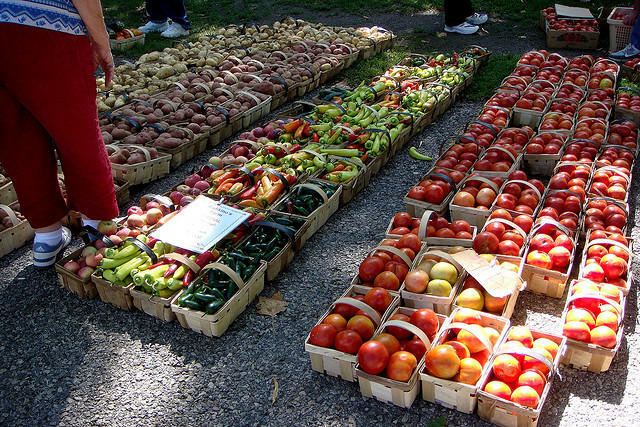 Rumors are circulating that the Beechview and Bloomfield farmers markets are on the chopping block. The North Side market (pictured) and five others are set to open as scheduled this spring. Councilwoman Natalia Rudiak, who represents Beechview and other South Hills neighborhoods, recommitted a bill to renew a license agreement between the city and the Catholic Diocese of Pittsburgh, which has hosted the Beechview market in the parking lot at St. Catherine of Sienna Parish in years past. The bill had initially received preliminary approval at last week’s committee meeting, but concerns about the future of the market prompted Rudiak to bring the topic up for discussion again. Parks and Recreation Director Jim Griffin said they are re-evaluating the Bloomfield market, but did not go into specific details. He also said rumors about the demise of the Beechview Farmers Market are false, but that organizers are considering “right-sizing” the market, which has suffered from low attendance. “It may be a fewer number of offerings, it may be a more focused offering … but it may also be a fewer number of vendors selling a wider variety of products so they have a greater opportunity to make a profit,” Griffin said. Economic development consultant David Brewton likened the problem facing the markets to a chicken-and egg-situation. “Traffic decreases, so fewer farmers are interested, so fewer farmers come, so the traffic decreases, and we’re in a downward spiral,” Brewton said. That downward spiral threatens to exacerbate a problem facing many of America’s cities: lack of equity in who has access to nutritious food. Rudiak’s comment was in response to Griffin touting the growth of farmers markets in the city, including the Squirrel Hill Farmers Market, new last year, and plans to revive the now-defunct Highland Park Farmers Market. Councilwoman Theresa Kail-Smith had even stronger words for Griffin, saying she had been unsuccessfully trying to bring a farmers market to the West End for six years. Currently, the city operates markets in East Liberty, Carrick, Downtown, Squirrel Hill, North Side and South Side. Rudiak said she wants to meet with Griffin and other stakeholders to look at how farmers markets are managed. Councilwoman Deb Gross, who represents the Strip District and other East End neighborhoods, suggested an even broader conversation. She said she had learned from farmers who sell produce in the Strip that the city can and should do more to support local food production and distribution. “I’ve spent some time talking with them about the economy that creates and produces this food and distributes it, and there’s an entire infrastructure that we should be paying attention to,” Gross said. Council plans to hold a post-agenda meeting on the issue in the coming weeks, though no date has been set.